The Championship will begin on Friday 1 February with the meeting of Ireland and England in a 5pm kick-off at Energia Park in Dublin. The second match will see Scotland face Italy in Glasgow, also on the Friday, while Champions France will get their 2019 campaign underway in a Saturday-evening clash with Wales in Montpellier. Round Two will feature the hotly anticipated meeting of England and France. The two will meet in Doncaster in a replay of last year’s thriller, which saw a world record crowd of 17,500 attend a superb match at Stade des Alpes in Grenoble. That clash, decided by France full-back Jessy Tremouliere’s late try, proved crucial to the outcome of the Championship and both teams will know that this fixture could be equally important to the outcome in 2019. Scotland will face Ireland in Glasgow on Friday while Wales will travel to Lecce for a meeting with Italy on Sunday in the other Round Two fixtures. There will then be a gap week before France take on Scotland in Lille while Ireland will travel to Parma for a meeting with Italy on Saturday, 23 February. The following day, Wales will face England at Cardiff Arms Park in their first home game of the Championship. After another gap week, Friday night lights at Scotstoun will begin Round Four with Scotland set to face Wales. Scotland will be keen for revenge having just lost out in a tense 18-17 encounter in Colwyn Bay last year. On Saturday, England will take on Italy at Sandy Park while Ireland will host France in Dublin. The final round of matches will begin at Twickenham with England hosting Scotland directly after the equivalent men’s match. The Championship will then conclude on Sunday March 17 with Italy v France, set to be played in Padova, and the clash of Wales and Ireland in Cardiff. The Championship will once again see fans across Europe support their team. In total, the 2019 Women’s Six Nations will visit 11 different host venues with Montpellier, Glasgow, Dublin, Lecce, Doncaster, Lille, Cardiff, Parma, Exeter, Padova and London all set to host fixtures. 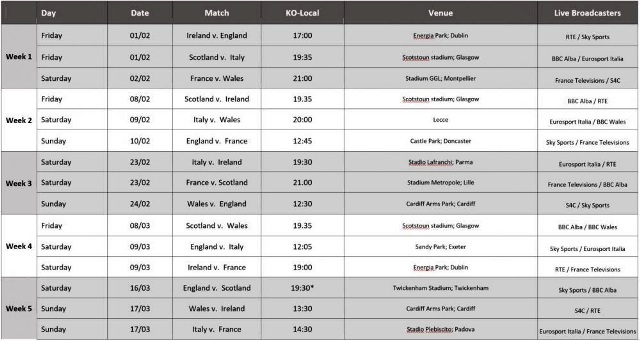 France Télévisions (France), Sky Sports (England), RTÉ (Ireland), BBC Wales / S4C (Wales), Eurosport Italia (Italy) and BBC Alba (Scotland) will carry a full programme of their national team’s fixtures.